What am I listening to this holiday season? The holidays, to me, are all about nostalgia. The holidays get me in that warm, cozy spirit that makes me want to spend countless hours snuggled up in front of my TV with a hot cocoa in hand. Romantic comedies on repeat aren’t to blame as well. The holidays also remind me of home. As everyone returns home for the holidays to spend time with their loved ones–family, friends or distant relatives alike–there is a particular spirited, warm-loving and congenial spirit in the air. Laughs, bright smiles, platters of food, lights lit up in the darkness and colors of reds and greens come to my mind. The warmth of family and good-tidings lift my spirit, for I realize that, when it comes down to it, our loved ones are always there for us. Whether we see them everyday or once a year, the time spent together this season is something that doesn’t go unnoticed. For me, a lot of my fortifying adolescent years was spent in reflection–and homage–to the music of the years of my parents. When I first picked up the guitar at only 12-years-old, I immediately discovered an undying and selfless love to it. It spoke to me in ways other things in my life couldn’t. And it responded back to me. In a deep, deep way. It was then that I discovered how saving music can be. As one of those cynical little angst-ridden teenagers who wished she had grown up in a time different than her own, I grew in love with oldies. I had discovered the music of the 70s and the intricacies in guitar-playing that existed back then. I fell in love with the stories of the 80s and the “Brat Pack” as they emitted a hip, sunglass-ridden ‘coolness’ that wasn’t to be found today. And, beside all that, those times were so innocent and genuine. No one was trying to be anything they weren’t. No one was out trying to prove themselves as something. They all just did what they did and owned up to it. That confidence grew a liking to me. So, when it comes to what I am listening to this holiday season, I am paying homage to the songs that have captivated me over the years. 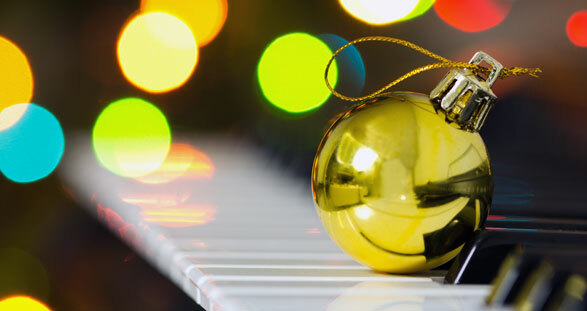 Whether it be ones that encapsulate a period of time, an old friend, the 80s, of love or Christmas or the holidays… These songs strike a particular chord in my heart. And I hope they plunge you into a nostalgia of your heart as well. This song was featured in 2006’s Just Friends, starring Ryan Reynolds and Amy Smart (my favorite Christmas/romcom movie, by the way), and how can you not love it? It is the epitome of high-school romances and lost loves; of having a crush on “that girl” in high school and seeing her later in life; of everyone liking that girl in high school and being “friend zoned.” I don’t know why, but I can never seem to get enough of this movie. Whether it’s chubby Ryan Reynolds or weirdo Anna Faris or girl-next-door Amy Smart, I just find myself seeing a lot of myself in this… This song encapsulates high school in a perfect, simple way. What better way to go into the holiday season cozying it up next to this one? You all know this song. And something about this song makes you want to get groovy and romance. It’s a deeply romantic song and takes you back to lost loves, hopeless loves… You get nostalgic with this song. You reflect on your own love. You reflect on your own loneliness. You just reflect. This song takes you back into another time when love seemed so simple. And that feeling of love comforts you, yet pains you at the same time. The holidays are here to remind you of that. Throwing it back to 2011 when Meg & Dia was still a ‘thing’ and the band was struggling to make ends-meet, recording self-recorded albums in their mother’s kitchen and cabins in no-man’s land, this lovely gem came from those hard times. A definite jewel in a bunch of lost tracks from their Be Careful, I Love You, Stay in Touch EP, this song was something different from what long-time Meg & Dia listeners have been used to. It emits a pure harmonic lullaby played against softly strummed chords with a sort of jazzy-twang and soft percussion. It gives you that “Mmph” feeling that isn’t familiar to their repertoire, but Dia’s voice and Meg’s accompanying harmonies prove romantic, lullaby-ridden, and daydreamy. It’s soothing and calming, which is what the holidays call for. Perfection. This song is an absolute beauty and charmer. Originally by Michael Bublé, close-friend and country-artist Blake Shelton adds his own special, warm ‘home’ kind of touch to the song. It’s about being away from home and from your lover, which many of our working or college-ridden selves can relate to. Christmas and the holidays is all about coming back home and returning to the places we grew up. We remember our old-selves, reflect on our lives, and come to terms with what it is we grew up on, and what we have taken from it. This song is sweet. How can you not love it? What’s Christmas without some George Michael? This song’s a Christmas classic. It puts you into the Christmas-loving spirit… I don’t think I need to explain. One of my all-time favorite songs, song covers, and songs by Maroon 5, this hidden gem was made for the 2006 family-movie Hoot. It features a sultry Adam Levine’s voice against the Bill Withers classic. It truly is a ‘lovely day’ when you get some soul and rhythm-and-blues within the holiday season. It’s uplifting. Optimistic. Endearing. Humble. It’s a song about finding safety in another. And it’s all about love. It’s a ‘lovely day’ when you learn to love this season.